(NaturalNews) The best food on store shelves to buy is that food which DOES have holes and nicks where the insects ate some. That proves it's edible. Recent documentaries show entire fields of genetically modified corn that all looks plastic, with not a bug or bird in sight, not a butterfly or a gnat or a fly, but why? Did you know that a diet containing GM soy and maize fed to rats for just 90 days caused a wide range of toxic effects, including DNA damage, blood changes, and damage to the liver and kidneys? If you consume GMOs regularly, your gut is actually creating pesticide. You are consuming the genes of organisms that destroy the digestive tracts of beetles and worms. Currently, about 250,000,000 Americans are guinea pigs for the HUGE GMO experiment going on. America is one big laboratory, and GM food is the ominous variable with untested outcomes for humans. It's a long-term, scary test that at least 80% of Americans undergo, whether voluntarily or involuntarily, every day. However, it's worth noting that research revealed lab rat liver damage as early on as 30 days, and half the babies died in just three weeks! Are you eating GM corn and GM soy daily? How will YOU feel next month? How about your kids? There is research you should be aware of, and it's from a VERY detailed study done in 2014. Also, according to a separate published study by the same team of researchers, GM food may also have the ability to "reactivate dormant viruses, create new viruses, and cause cancer by causing over-expression of normal genes." They describe the body ingesting fragments from the CaMV-35S "promoter" used in many GM crops. It shows up "incorporated" in the blood, liver and BRAIN TISSUES of experimental rats. The biological impact and outright danger of GMO genes transferring into humans and their tissues is the subject of great concern here. The negative impact of genetically modified (GM) food HAS BEEN evaluated. Liver cells in animals show aberrations and increased ratios of DNA fragmentation. What does that mean in layman's terms? -- That if you are an animal, as rats and humans both are, then your cells are mutating too, weakening, and will soon be multiplying uncontrollably, because the mechanism that controls normal reproduction is broken or mutated. Some of your cells will experience a programmed cell death. This makes it easier for cancer cells to take over an organ or some already damaged area of the body, including the brain. This cancer you may be "experiencing" could come from biochemical alterations that create health hazards linked to the ingestion of GM components. Rats given certain GM vegetables were found to have DEADLY amounts of toxicity in the kidneys, liver, testes, sperm, blood and DNA. Studies have linked GM feed to sterility and infant mortality. 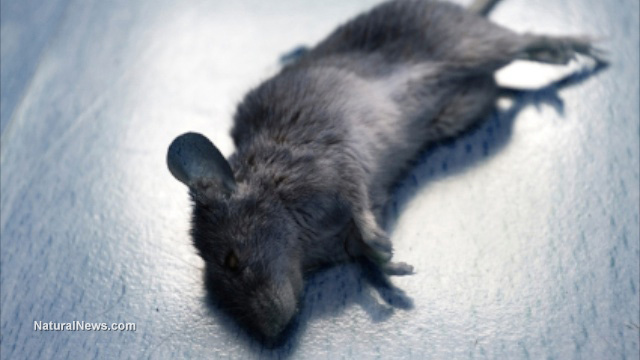 Enzymes resistant to the famous weed-killer "glyphosate" were found in the blood of rats. These are chromosomal aberrations. Nearly every organ observed during research showed DNA damage from a GM soy diet. Soy and corn are two of the most commonly grown GM crops because they are fillers in thousands of popular food products. As a walking lab rat that consumes GM "feed" regularly, do you experience hives, itching or scaly or dry skin regularly? Do you experience asthma and wheezing chronically, like after every big meal or when you try to jog or work out? Are you experiencing abdominal pain, a tingling sensation in the mouth and some nausea from what you thought was a nice meal at a nice restaurant? Maybe you're making trips to the BUG-FREE food bar. Most canola, you know, is GMO. Attention, parents: note that the above research also showed that half the babies fed GM soy died within three weeks. Sure, rats are just animals in a lab, but where are you "standing" right now? People want their bug-free, inexpensive food, but is cancer a price worth paying? So, do you still want that food that the bugs won't eat? What about that "food" that gives lab rats cancer tumors the size of golf balls within three months? You can't live without your kidneys, so you may want to switch to 100% organic food or, at least, avoid GMO like the plague, because it really is one.